Ha...a Beaver or Husky in the house sounds like a great way to get even for a razor for Christmas to me!! Unlike a Husky, Alec won't be able to get hair in his ears until later in life. Does Wa. (I don't know what their accepted abbreviation is) allow sherpas for Freshmen? I have seen their helmets with the big W on them. Just think of it, combine your 'O' for Oregon and his 'W' for Washington and you have "OW" which is what it'll be when they meet on the gridiron or even tiddly-winks. Ah, ear hair. The great equalizer. In the end, we all end up looking like Yoda. There's a lot of "ow" going on when the Ducks and Dawgs meet on the field. It's more than a rivalry game. It's a grudge match. They wiped the field with us this year, but it's kind of understandable. We'd humiliated them for the past 12 seasons. It was payback time. 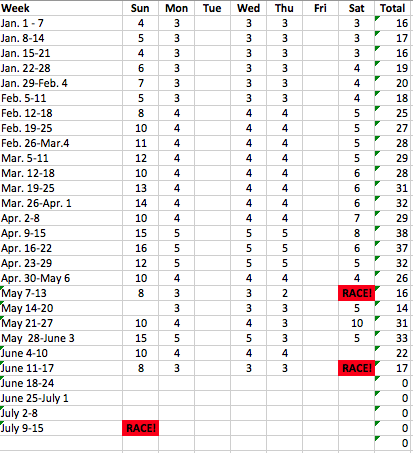 I had a little time at work this evening to start formulating a training schedule for Alita and I as we get ready for our races next spring. Here's my first crack at it. I didn't factor in walks that Alita usually takes at school, so that'll be a bonus for her. I'll also sneak in some additional runs or distance on days we can't train together. Right now, it appears we'll be teaming up on Saturday, Sunday and Monday. The other days, we'll have to go solo. She'll probably do those days on the treadmill, which lends itself well to big weekly hill climbs. I didn't fill out the runs after the 12-hour run yet, but I hope to get in at least another 20 miler (presuming we go well over 20 at the 12 hour run) and some technical trail practice before Mount Hood. Got to be ready for those roots! Part of me thinks this schedule looks a little light, but Alita's coming back from a broken foot and I've been quite lazy, so I think we'll need to build it up slowly at first to avoid injury. And hopefully establish some new habits that'll last well beyond this year's racing season. Good for you for getting a head start on your training plan. I wouldn't worry about it being to light for the reasons that you mentioned. You can always adjust and add mileage if you're feeling good but if you start to hard and either one of you end up injured you've got no where to go. I'd be cautious on the Monday runs, with possibly swapping Monday and Tuesday. I'll send you a bill for that. Payable in coins only. $0.02. @nkrichards wrote: Good for you for getting a head start on your training plan. I wouldn't worry about it being to light for the reasons that you mentioned. You can always adjust and add mileage if you're feeling good but if you start to hard and either one of you end up injured you've got no where to go. Thanks for the thoughts, Nancy. We've talked about the possibility of flexing the schedule if it feels right. We may also juggle some things around if we head up to play in the Columbia River Gorge once the weather improves and we need some serious hill climbing practice. I have a name for the blog, but I'll keep you in suspense until it launches. @ounce wrote: I'd be cautious on the Monday runs, with possibly swapping Monday and Tuesday. Three days in a row will be tricky, but it's the only way to maximize our time training together. Our schedules don't allow us time to barely see each other during the rest of the week, let alone go for a run. I'm betting some those Mondays will end up being walks, especially at first. I think your 3 days is a row will be OK as long as you're cautious and make sure you treat them as recovery runs. After all you're training for longer races and eventually an ultra. I will do my best! Have a great new year. Ohhh.... the toe-bone's connected to the... foot bone! The foot bone's connected to the... ankle bone! Damn. What the hell IS it connected to? The blog has covered a lot of ground, figuratively and literally, as I tried to figure out what to do in the wake of my first (and so far, only) ultramarathon finish the year before. I'd expected to get back to ultras sooner, but things kept happening that threw me off track. Or... a bunch of other things happy and sad that happens over the course of two and a half years. It's been distracting, and a little demoralizing at times. (The races I did were fun, however.) I've appreciated the support I've gotten here as I've wrestled with it. Thanks! As far as building a better bumblebee? Well, that's a never-ending process. I've learned a lot since I started this blog, though, and I'm ready to put that knowledge to use not just for me, but for Alita, who has been bitten by the trail bug and is ready to experience trail race events as a participant rather than a volunteer. I'm not just doing this for me anymore. I think that may change things, and I'm looking forward to it. Among other things, there are the llamas. Now, with further adieu, Queen Bee and the Better Bumblebee!